Drywall Screws | Manufactured From High Quality Carbon Steel | ASP Ltd.
Drywall or plasterboard is typically a panel made of gypsum between two thick sheets of paper. The construction of ceilings and interior walls often involves the use of drywall, because it is faster than traditional lath and plaster. When you are securing drywall to wooden partitions or metal studding, it is important that you use the right type of screws. 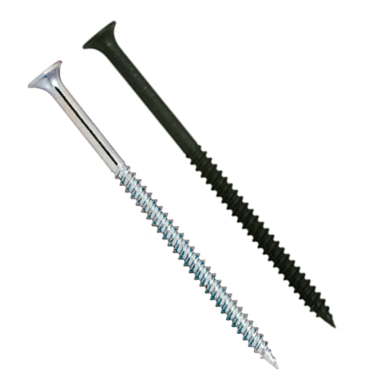 Plasterboard screws are designed specifically for the purpose of fixing drywall to joists. You can use them in conjunction with other building supplies to effectively fasten and finish drywall panels. Drywall compound, which is a mud made from water and gypsum dust, will create a smooth base for painting the drywall. Drywall screws will not blemish the surface of the panel once you seal it with the compound and use drywall tape to bind the seams. ASP Ltd offers a variety of screws designed for use with drywall and plasterboard material. All of our screws are manufactured from high-quality carbon steel, providing increased tensile strength. There is even a free screwdriver tip in every box of screws. We offer fine thread drywall screws and coarse thread drywall screws for different applications. Fine thread screws are better for piercing steel stud work, such as in commercial construction. Drywall screws with coarse threads are faster to use and are more resistant to withdrawing from timber studding which makes them the best choice for residential construction. We also offer drywall screws with different finishes – bright zinc plated or black phosphate. Drywall screws are all hardened for strength, with sharp points which allow speedier installation into metal or timber. Wafer head drywall screws are used to construct metal studding. They are self drilling so pilot holes are not required. Drywall screws can be driven to the necessary depth without causing any damage to the surface of the board, the screw itself, or your screwdriver or power tools. Noise levels are much lower when compared to nailing panels to timber or metal studding.